* Note: If you choose to Leave a Legacy in monthly installments, the first month will be charged at checkout and we will call or email you to schedule future payments. Thank-you for Leaving a Legacy! By purchasing a leaf, you help guarantee that future generations will be able to visit “Nature’s Wild Backyard” and see your commitment to helping build, not only our zoo but our community. 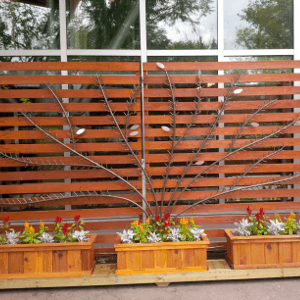 The tree is made from wrought iron with stainless steel leaves. For more information on “Leaf A Legacy” and why Natures Wild Backyard is important to the future of our children CLICK HERE.